Linux is one of the most secure and stable operating systems around, and yet, its user base hasn’t really grown as everyone expected it to. There are many reasons for this, and we won’t go into those right now. However, if you, like any other Linux user, are disappointed by the current market share stats, we can tell you some simple tips that will help you convince your Windows or Mac-crazy friends into using Linux. Now, many Linux users have already tried to coax their friends and family members to try out this popular and newbie-friendly distro called Ubuntu. A select few have succeeded and many have failed. So here, we will give you some important tips to help you spread the word about Linux without sounding like that arrogant nerd who has nothing but contempt for Windows or Mac. Yes, this is the first and the most important thing you need to do if you have to convince a Windows or a Mac user into using Linux. Ubuntu, Linux Mint and many other distros look extremely beautiful, and honestly, the latest version of Ubuntu (Ubuntu 11.10) looks just as good as a Mac. But hey, if you’re just going to just tell that to them do you think they’ll believe you? Even if they do believe you, they’ll still have no idea what Ubuntu or whatever you’re talking about looks like. My suggestion is, you take your own Linux laptop, hand it over to them and let them play around with it. If you’re on Ubuntu I’d recommend opening a new Guest session and handing over the laptop to them. That way, they’ll have a better idea as to how beautiful even an uncustomized desktop looks like. If, at all, it is impossible to show the desktop to your friend, send him or her a YouTube video of the desktop. The Show Don’t Tell policy also applies to feature comparisons. 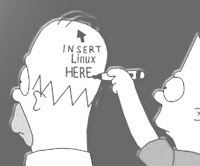 Let’s say you want to outline the salient features of Linux. Instead of giving a huge lecture about how virus-free, how fragmentation-free, how fast the desktop is, just show it to them. Take their Windows/Mac laptop and put it beside your own desktop. Start a timer and show your friend how fast it boots. I hate to repeat, but just show it, don’t talk about it. For a Linux user trying to convince a Windows user into the light side, there’s always the Windows-bashing that comes in handy. At least that’s what many Linux users think. Windows-bashing is great, everyone curses that dreaded operating system, but there’s no point telling a Windows user about it. I’m pretty sure he or she already knows about it. There must at least be a thousand Windows users cursing Microsoft even as you’re reading this article. But no way are they going to switch to something different. In short, don’t tell them that Windows is bad, don’t even talk about Windows. Just keep telling them: “Hey, I have this amazing desktop on my computer, you gotta try it out”. Hand over the laptop to them and let them do the Windows-bashing. When I converted my friend into a Linux user, all I did was showed him my laptop. I never mentioned a word about Windows or Mac. The moment he saw it, he started ranting about Windows like a pissed-off sports fan. Rather than helping them, show them how to get help and support on Linux. Don’t let them rely on you to fix every problem on their desktop. Just give them a short tour of Ubuntu forums, IRC, and manuals and let them figure out for themselves. Don’t, and I say it again; don’t ever start your pitch with the "free" part. In fact, it would be better if you drop the whole thing out of the conversation. Sometimes, they’re so impressed by Linux that they eventually end up asking you about its cost. Just look at them casually and say “it’s free” and wait for their reaction. One can "convince" X "to" Y, but not "convince" X "into" Y-ing. (Though one can "coax" X "into" Y-ing or "trick" X "into" Y-ing). In other words, "convince your friends to use Linux" or "coax your friends into using Linux" or "trick your friends into using Linux" are fine, but not "convince your friends into using Linux". Windows 7 is hardly anything like 98 or XP. Please concentrate on the strengths of GNU/Linux(community, a huge catalog of open software etc) instead of comparing with other OSes except when warranted. Whats the benefit o witch from Mac to Linux? You already have bought the hardware. And OSX gives you bash. In fact I moved form Linux to Mac because I got a system that was like a Windows/Linux Hybrid. All of the industry standard apps like Office, Photoshop, and such supported out of the box. All of my Linux scripts ported over with only mods to directories links, and I can install software from source. I totally get the move from Windows because I did that back in 1998. But I dont get why anyone would leave Mac for Linux. I don't offer to do computer work for them unless the computer is running linux. Usually the choice between free computer work vs paying the nerd turds at best buy is enough to sway them. Even though you might not want to emphasize the 'free' part, if you show them a system with rolling updates, you can point out that you can always have the latest version, and it's *still* free. Also much easier than upgrading to the next Windows version. I did eventually end up building a Linux box for one of them. It's still in use. Full disclosure: I have nothing against Mac users. In fact, I am one - I have a Mac Mini I use as an HTPC. I too would love for more people to use GNU/Linux. But I care little for people who are not willing to learn. For to use GNU/Linux you have to learn to do things differently. GNU/Linux is a 'different' operating system. It is not 'Windows', period. I too started out learning computing on the ubiquitous of them all, Windows. But later I discovered GNU/Linux and learnt it. For I found that 'spending' time learning GNU/Linux was more pleasurable than paying for the privilege of 'using' Windows. And that is how the 'free' part plays out. For once you have learnt it you OWN it. I was typing the response to this article, but after a while web page refreshed and I lost all of the text. Dam, why the heck is there a need for refresh of web page! "I was typing the response to this article, but after a while web page refreshed and I lost all of the text. Dam, why the heck is there a need for refresh of web page!" Same thing happened to me. Then I did the whole thing again and this time the Select profile, Post comment and preview buttons below went bonkers. Hope this works! My experience convincing ordinary users is quite different. With users who don't care about tech I found that the issue of free works very well. Even better is the freedom from viruses. These are the main selling points for such users. Most of the time ordinary users are only willing to switch when they have a problem with Windows (I've never gotten a user to switch from Mac to Linux. Has anybody ever done that?). THose windows problems generally have to do with viruses. SO these users are normally looking at spending money on buying Windows plus antivirus and other apps, plus they are worried about more viruses. SO what draws them to Linux is the fact that they don't have to buy anything and they don't have to worry about viruses. They generally don't appreciate how 'cool' Linux is. Excellent point about showing vs. telling. But if you're going to show people Unity they will run screaming to Mac or even WIndows 8. Linux Mint Rocks. The latest LM11 is too good and the windows users don't feel like they are in a new OS cos of its similarity to Windows. I have been using Linux Mint for the last 1.5 years, and its been the most stable OS I've used till now. Almost everything is OUT OF THE BOX.